About this guide: This guide will show you how to determine the appropriate resistor value to use when separating LEDs in a set of OEM tail lights. Doing so will allow you to use our patented LED Sequencer module to enable sequential turn signals, show mode, and more. We favor this approach as opposed to a full retrofit (completely replacing LEDs) because this saves a lot of money on parts as well as labor plus the OEM LEDs tend to look really good as-is and are highly reliable. 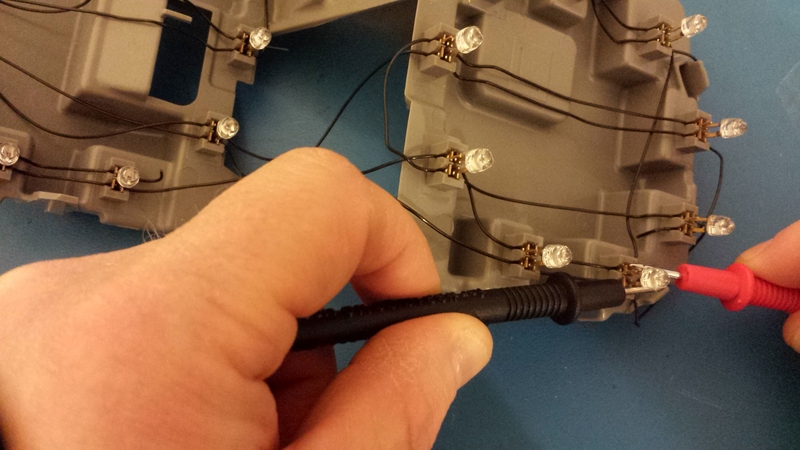 In this guide, we will include photos from a G35 LED assembly. 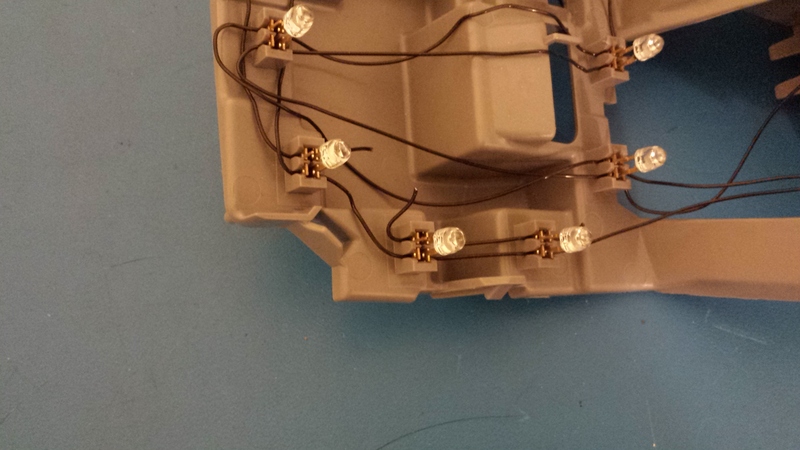 In general, this process is fairly simple and should apply to any model that uses LEDs. You will need to open your tail light before getting started to expose the intenal wiring. This typically involves cutting. If you’re not comfortable with this, then we recomend you stop now and contact one of our certified installers. We also recommend that you have a basic understanding of how LEDs work as well as what volts and current are (i.e. Ohm’s law). Setup for re-wiring an OEM LED setup for sequentials. 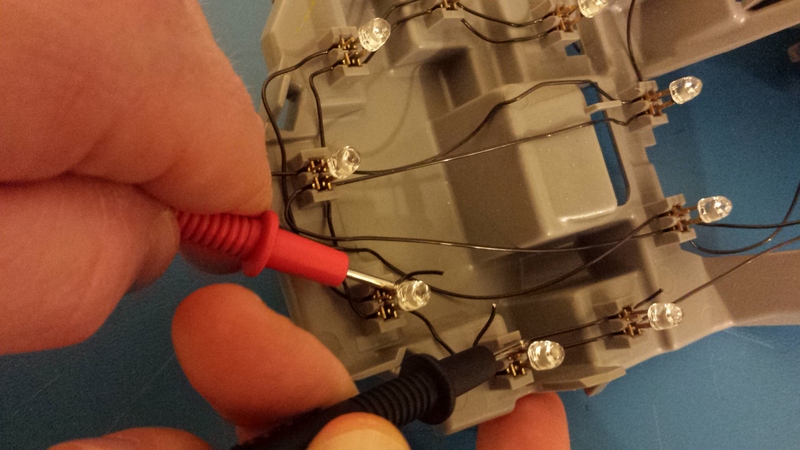 Step 1 – Getting set up: Make sure your 12V power supply actually produces 12 volts. This is especially true if you are using a recycled wall-outlet supply as these can often vary quite a bit from the specs on the label. Even if you are using a very high quality power supply, these can drift as they age, so it’s worth a few seconds to check. You don’t want an improper power supply to throw off your measurements. Step 2 – Identifying inputs: Find the input connection where power is applied to turn on the LEDs. There will typically be 3 or more wires here. In this case, is ground/black, bright/yellow (for turn & brake) and dim/white (for parking lights). You need to identify which is which before you do anything because applying power to the wrong connections can do damage so double check your work and don’t guess. 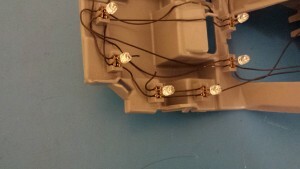 OEM Input wires for G35 tail lights. Step 3 – Connecting inputs: Connect ground input to your power supply ground and the bright input to your power supply +12. If you have multiple inputs (for example some models have amber turn signals and red brake lights) then you’ll need to come back to this step as you make subsequent measurements. Step 4 – Measuring Voltage Set your multi-meter to measure DC-Volts. Turn on your power supply so that the LEDs light up. Pick an LED and measure the voltage across it. Write this down. If there are different types of LEDs in your assembly (even just different color), you’ll want to do this for each type. You may also want to measure several LEDs just to make sure they are all consistent. You’ll also want to make note of which side is the positive side (anode) and which is negative (cathode) because you’ll need to know this when you re-wire them later. Turn off the power supply when you are done. Step 5 – Measuring current: Set your multi-meter to measure DC-mA. Using a multi-meter for current measurement is typically a bit more complicated than measuring volts or ohms — consult the multi-meter’s user manual if you’re not sure how. Now pick any wire the connects one side of any LED (doesn’t matter which side) to anywhere else and cut it. An LED connection that has been cut for making a current measurement. Next, turn on your power supply. 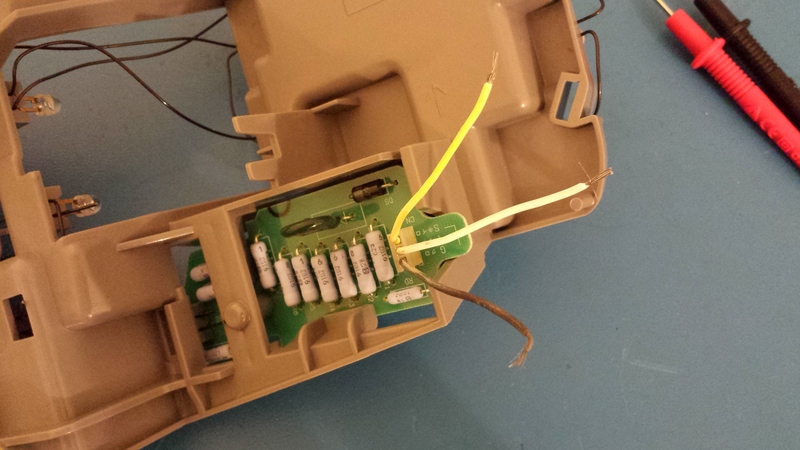 You’ll notice one or more of your LEDs, including the one that was attached to the wire you just cut, don’t light up. Touch your two probes to the two sides of the wire you just cut, this should cause the LED to light up. Record the current measurement. As in the prevous step, you need to repeat this for each different type of LED. Turn off the power supply when you are done. Step 6 – Calculating the resistor: Now we need to calculate the resistor value you will need. Before doing this, you will need to figure out how you plan to arrange the LED circuits. If there are more LEDs than channels on our sequencer, then some of them will need to be ganged on one channel. If you need to do this, then we recommend putting them in series where possible as this is both more energy efficient and puts less stress on our sequencer. However, make sure that the sum of Vf for all the series LEDs is less than about 9V to help ensure reliability. The diagram below shows what your circuit will look like for each channel with one LED per channel as well as the equation for calculating your resistor (Rs). Vf is the voltage measured in step 4 and If is the current measured in step 5. Vs is 12 volts. If you have multiple LEDs in series, then add up the Vf for each one. If you have multiple LEDs in parallel, then give each one its own resistor. We recommend rounding this calculated value up to the next higher value that you can buy, this may cause them to be a tiny bit dimmer, but will ensure that you will get the same or better reliability as the OEM setup. You always want to round this number up. Using too small of a resistor might seem ok when you test in your lab, but they will fail when they are out baking in the summer heat. 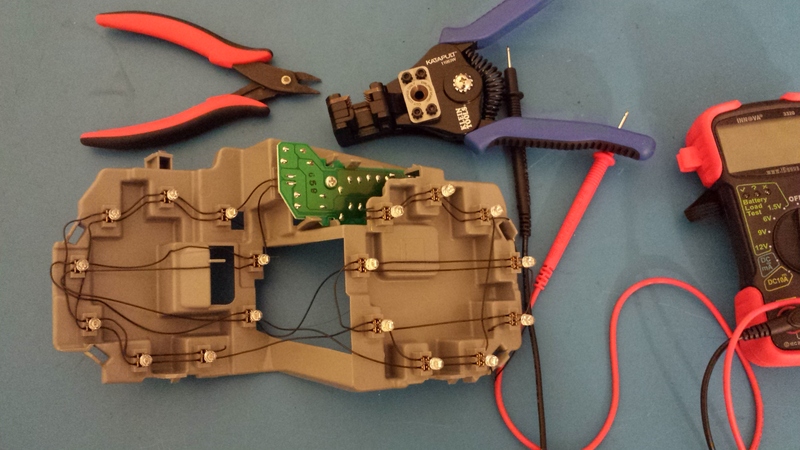 Now you are ready to wire up your sequencer! You will need to cut the remaining wires in your LED assembly and start wiring. You can also remove that OEM circuit board since you’ll be replacing it with a Ghozt Sequencer. Enjoy!